It's hard to beat a dish that's beautiful, flavorful, nutritious and easy to prepare. This week's recipe earns high marks in all four categories and takes advantage of seasonal asparagus � now at its peak at most farmers' markets. Combined with fresh thyme, fragrant lemon and juicy tomatoes, our roasted halibut is sure to become a family favorite. Halibut, a firm fish with mild flavor, is an under-rated flatfish that is often overlooked for the more expensive members of its family � sole and turbot. When prepared properly, halibut is slightly sweet and supple. It's a great choice for dining alfresco. When buying halibut, the fillets should be white and springy to the touch. While asparagus is available year round, it is most tender during spring and early summer. Dubbed the �king of vegetables� by King Louis XIV of France, this versatile veggie is an excellent source of folate and also provides vitamins A and C.
Choose straight stalks with closed, tight tips and a bright green color. Many cooks also prefer thicker spears, which are often more tender than the thinner ones. Once purchased, asparagus should be eaten quickly. 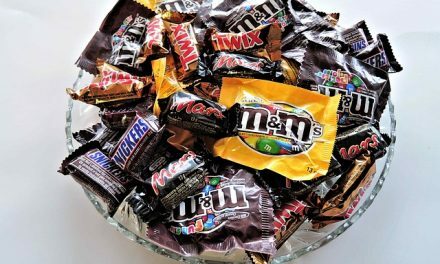 If you need to store it, place the stalks in the coldest part of the refrigerator, standing upright in a shallow cup of water. Halibut is an ideal choice for this recipe because it is well suited to strong seasonings, like thyme. The aromatic herb, scented with notes of mint and lemon, has historically been regarded as an antiseptic and disinfectant. Cultivated in southern Europe, thyme is the darling of French cuisine and a favorite ingredient in Julia Child's kitchen. Trim asparagus and lay on bottom of a medum-sized baking dish. Scatter cherry tomatoes on top. Sprinkle with salt and pepper. Lay thyme sprigs on top. 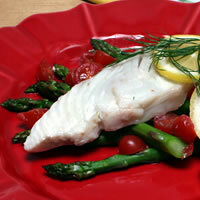 Place halibut on the bed of asparagus. Combine lemon juice and olive oil and drizzle over halibut. Sprinkle with additional salt and pepper, if desired. Roast uncovered for 18 to 20 minutes, or until fish is done.